The XB-70 Valkyrie, with a planned cruise speed of Mach 3 and operating altitude of 70,000 feet, was to be the ultimate high-altitude, high-speed manned strategic bomber. Events, however, would cause it to play a far different role in the history of aviation. To achieve Mach 3 performance, the B-70 was designed to "ride" its own shock wave, much as a surfer rides an ocean wave. The resulting shape used a delta wing on a slab-sided fuselage that contained the six jet engines that powered the aircraft. The outer wing panels were hinged. During take off, landing, and subsonic flight, they remained in the horizontal position. This feature increased the amount of lift produced, improving the lift-to-drag ratio. Once the aircraft was supersonic, the wing panels would be hinged downward. Changing the position of the wing panels reduced the drag caused by the wingtips interacted with the inlet shock wave. The repositioned wingtips also reduced the area behind the airplane's center of gravity, which reduced trim drag. The downturned outer panels also provided more vertical surface to improve directional stability at high Mach numbers. Attached to the delta was a long, thin forward fuselage. 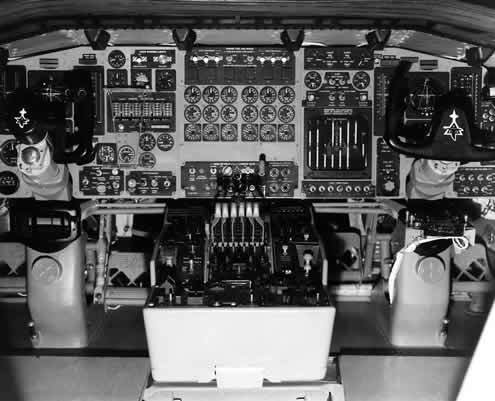 Behind the cockpit were two large canards, which acted as control surfaces. As impressive a technological feat as the B-70 represented, the aircraft was under development at a time when the future of the manned bomber was uncertain. During the late 1950s and early 1960s, many felt that manned aircraft were obsolete, and the future belonged to missiles. As a result, the Kennedy Administration ended plans to deploy the B-70. 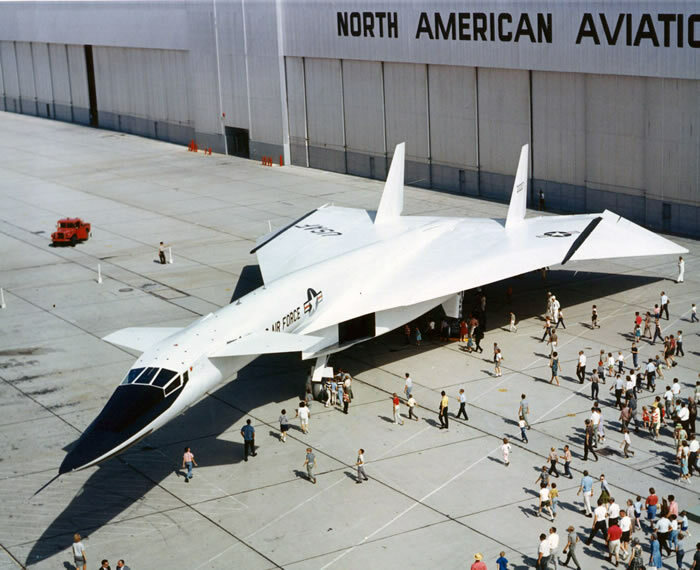 Two experimental XB-70A prototypes were under construction at North American Aviation when the program was canceled. At the same time there was growing interest in an American supersonic transport (SST). Jet airliners had cut flight times by more than half in comparison to propeller-powered aircraft. A Mach 2 or 3 SST would make a similar improvement over the new subsonic jet airliners. The Flight Research Center (FRC-now the Dryden Flight Research Center, Edwards, Calif.) had several SST studies underway during the early 1960s. NASA's Douglas F5D-1 was used for landing studies, a North American F-100C was modified to simulate SST handling qualities, a North American A-5A was used to simulate an SST for tests of the air traffic control system, and a Lockheed JetStar was modified as an in-flight SST simulator. The XB-70 Valkyrie seemed to be a perfect testbed for SST research. It was the same size as the projected SST designs, and used similar structural materials, such as brazed stainless steel honeycomb and titanium. Thus, the XB-70A's role changed from a manned bomber prototype to one of the most remarkable research aircraft ever flown. 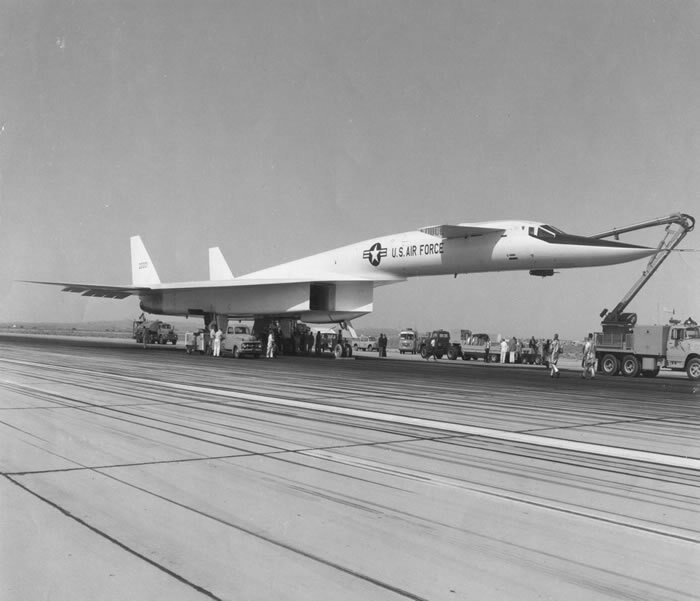 The XB-70A number 1 (62-001) made its first flight from Palmdale to Edwards Air F orce Base, Calif., on Sept. 21, 1964. 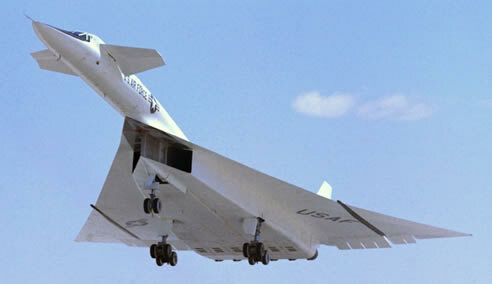 Tests of the XB-70's airworthiness occurred throughout 1964 and 1965 by North American and Air Force test pilots. The Flight Research Center prepared its instrument package. Although intended to cruise at Mach 3, the first XB-70 was found to have poor directional stability above Mach 2.5, and only made a single flight above Mach 3. Despite the problems, the early flights provided data on a number of issues facing SST designers. These included aircraft noise, operational problems, control system design, comparison of wind tunnel predictions with actual flight data, and high-altitude, clear-air turbulence. NASA Ames Research Center, Moffett Field, Calif., wind-tunnel studies led engineers at North American Aviation in Downey, Calif., to build the second XB-70A (62-207) with an added 5 degrees of dihedral on the wings. This aircraft made its first flight on July 17, 1965. 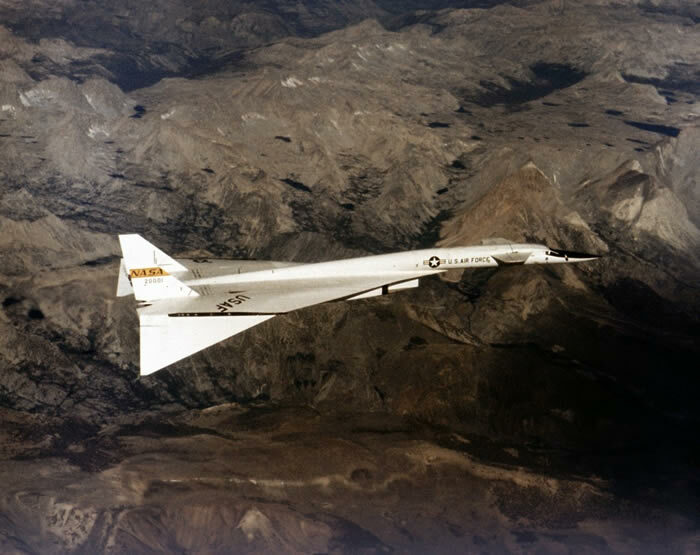 The changes resulted in much better handling, and the second XB-70 achieved Mach 3 for the first time on Jan. 3, 1966. The aircraft made a total of nine Mach 3 flights by June. At the same time, a joint agreement was signed between NASA and the Air Force to use the second XB-70A prototype for high-speed research flights in support of the SST program, selected due to its better aerodynamics, inlet controls, and a much superior instrument package, compared to the first aircraft. The NASA research flights were to begin in mid-June, once the North American Aviation Phase I tests of the vehicle's airworthiness were completed. NASA research pilot Joe Walker was selected as the project pilot. The flights were to evaluate the aircraft on typical SST flight profiles, and to study the problems of sonic booms on overland flights. These plans went awry on June 8, 1966, when the second XB-70 crashed following a midair collision with NASA's F-104N chase plane. Joe Walker, F-104N pilot, died in the accident. North American test pilot Al White ejected from the XB-70 in his escape capsule, but received serious injuries in the process. Co-pilot Maj. Carl Cross, who was making his first flight in the XB-70, was unable to eject and died in the crash. 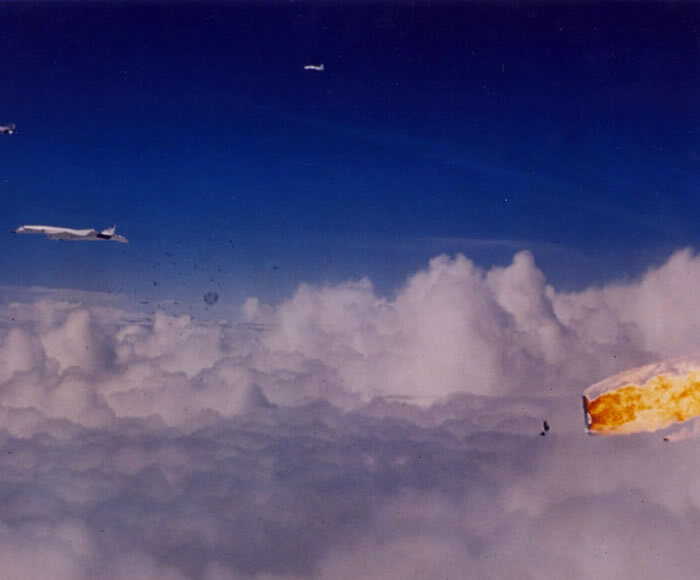 The deaths of Walker and Cross, and the destruction of the second XB-70 had major consequences for the research program. 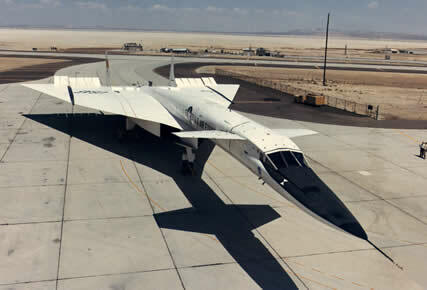 The second XB-70 had been selected for the Phase II tests, which were to be conducted jointly by NASA and the Air Force. With this aircraft now destroyed, only the first aircraft was available. Given the aircraft's shortcomings, the Air Force began to doubt that it would be able to meet the Phase II test goals. The first XB-70 was undergoing maintenance and modifications at the time of the accident to its sister ship. It did not fly again until Nov. 3, 1966. Col. Joe Cotton piloted it, while NASA research pilot Fitzhugh Fulton served as co-pilot. The flight reached a top speed of Mach 2.1. Between November 1966 and the end of January 1967, a total of 11 joint Air Force/NASA research flights occurred. Cotton, Fulton, and Van H. Shepard of North American Aviation were crewmen on these flights. A top speed of Mach 2.57 was the highest attained during the remainder of the XB-70 program. These flights were made as part of the National Sonic Boom Program. 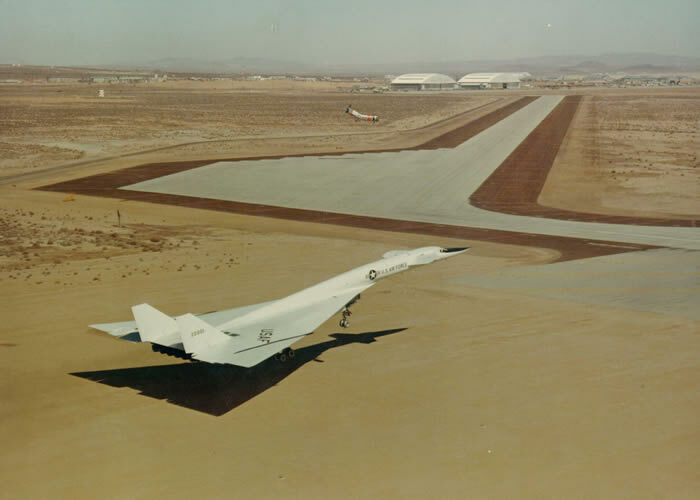 The XB-70 flew at differing altitudes, Mach numbers, and weights over an instrumented test range at Edwards. The "boom carpet" area was determined and the overpressure measured on two specially constructed housing units. The tests showed that a large aircraft, such as the XB-70 or the projected SST, could generate overpressures high enough to cause damage. Moreover, when the XB-70 made a turn, its shock waves converged, and often doubled the overpressure on the ground. Following these tests, the XB-70 was grounded for maintenance that lasted 2 1/2 months. The Air Force had concluded by that point that the XB-70 program should be turned over to NASA as soon as possible. 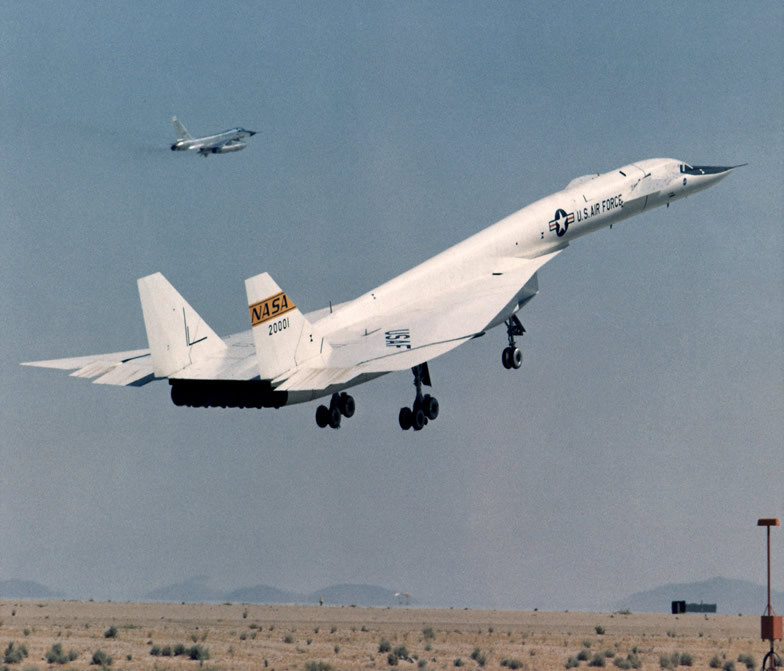 FRC director Paul Bikle and Air Force Flight Test Center (AFFTC) commander Maj. Gen. Hugh Manson created a joint FRC/AFFTC XB-70 operating committee on March 15, 1967. This was patterned on similar committees established for the X-15 and lifting bodies. The NASA XB-70 program continued to receive Air Force assistance, in terms of aircraft support and Air Force test pilots. The first NASA XB-70 flight occurred on April 25, 1967, by Fulton and Cotton. By the end of March 1968, another 12 research flights had been completed. The pilots included Fulton, Cotton, and Shepard, as well as Lt. Col. Emil Sturmthal and NASA research pilot Don Mallick. The flights acquired data to correlate with an Ames ground-based SST simulator and the JetStar in-flight SST simulator at FRC. 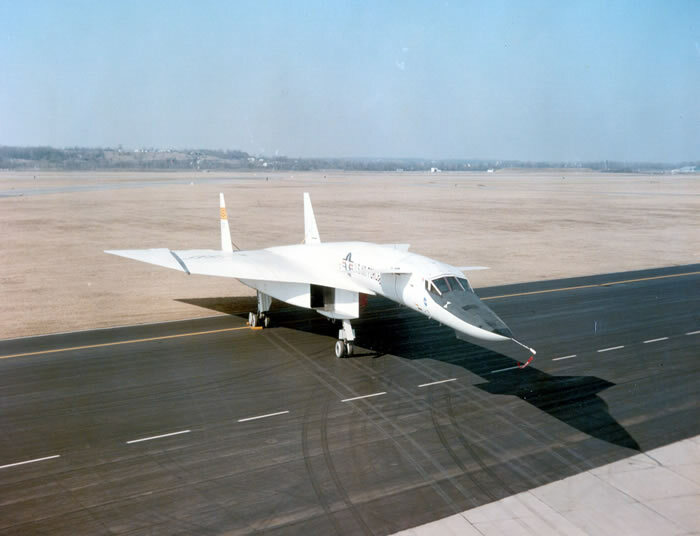 Other XB-70 research goals were to measure its structural response to turbulence; determine the aircraft's handling qualities during landings; and investigate boundary layer noise, inlet performance, and structural dynamics, including fuselage bending and canard flight loads. 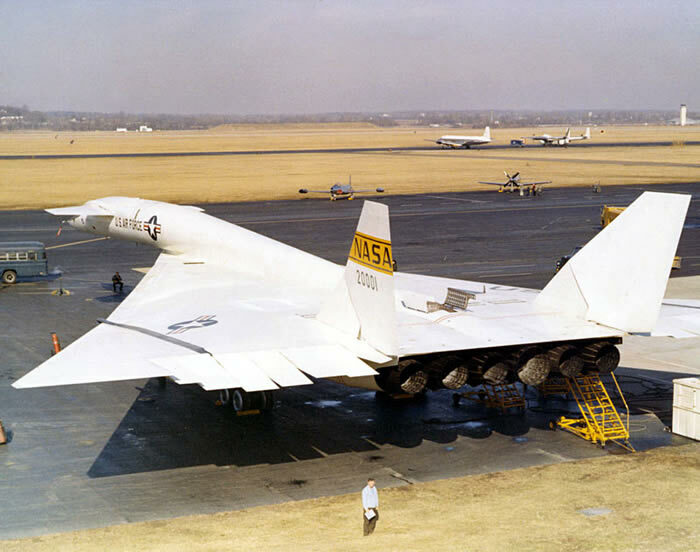 The XB-70 underwent modifications after a final flight on March 21, 1968. During research flights, the XB-70 pilots had frequently experienced trim changes and buffeting during high-speed, high-altitude flights. These resulted from clear-air turbulence and rapidly changing atmospheric temperatures. For a specialized research aircraft, these characteristics were little more than annoying; on a commercial SST, however, they would be uncomfortable for the passengers, increase the pilots' workload, and shorten the structural fatigue life of the SST. The XB-70 was fitted with two small vanes for the Identically Located Acceleration and Force (ILAF) experiment. The vanes rotated 12 degrees at a rate of up to 8 cycles per second. This induced a structural vibration in the XB-70 at a known frequency and amplitude. The XB-70's accelerometers detected the disturbances, then signaled the aircraft's stability augmentation system to damp out the motion. When XB-70 research flights resumed on June 11, 1968, the ILAF proved its ability to reduce the effects of turbulence and atmospheric temperature changes. Despite the accomplishments of the XB-70, time was running out for the research program. NASA had reached an agreement with the Air Force to fly research missions with a pair of YF-12As and a "YF-12C," which was actually an SR-71. These represented a far more advanced technology than that of the XB-70. In all, the two XB-70s had logged 1 hour and 48 minutes of Mach 3 flight time. A YF-12 could log this much Mach 3 time in a single flight. The final XB-70 research flight occurred on Feb. 4, 1969. Fulton and Sturmthal made a subsonic structural dynamics test and ferry flight. The XB-70 took off from Edwards and flew to Wright-Patterson Air Force Base, Ohio, where the aircraft was put on display at the Air Force Museum. The first XB-70 made 83 flights totaling 160 hours and 16 minutes, while the second XB-70 logged 46 flights in its brief life, totaling 92 hours and 22 minutes.